MMMaDespite the threat of rain, it was time for another dawn patrol to check on things in DC. After all, the entire city (or so the news played it) had experienced a power loss yesterday, who knows what conditions would be like around the monuments. 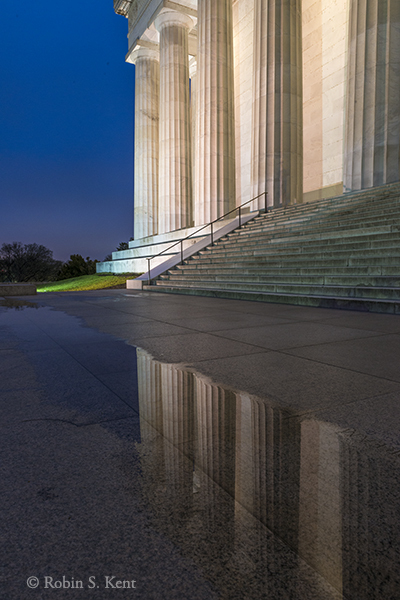 First stop, the Lincoln Memorial about 30 minutes before sunrise. I figured with the dismal weather, there would be no one else about. But what had been a deserted plaza two days ago was now filled with about 50 twenty-somethings engaged in an energetic calisthenics workout . I managed to resist their enthusiasm and climbed the steps in search of a puddle that might provide an interesting reflection. Shortly afterwards, the entire gang of exercise enthusiasts came up the steps apparently having completed their routine and intent on giving themselves a standing ovation for their efforts. This was my cue to head over to the Tidal Basin. 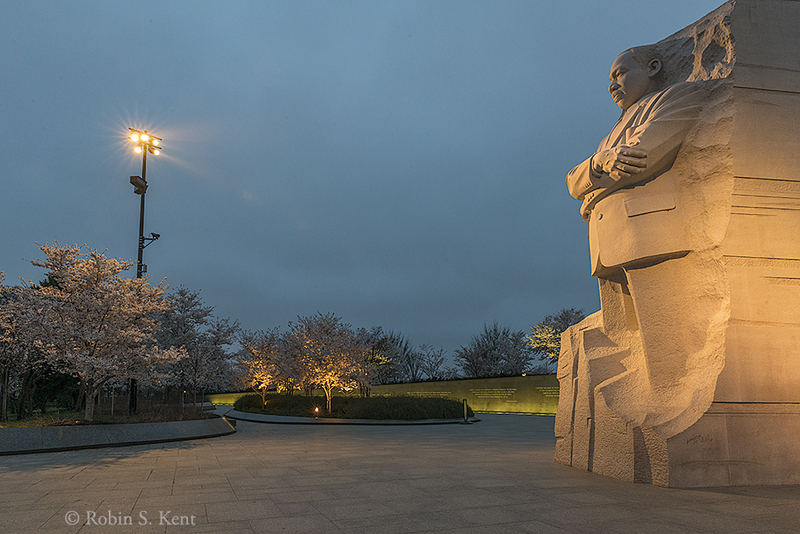 The lights were still ablaze at the Martin Luther King Memorial and it was clear that the cherry trees were making excellent progress. In fact, they are ready to be photographed. 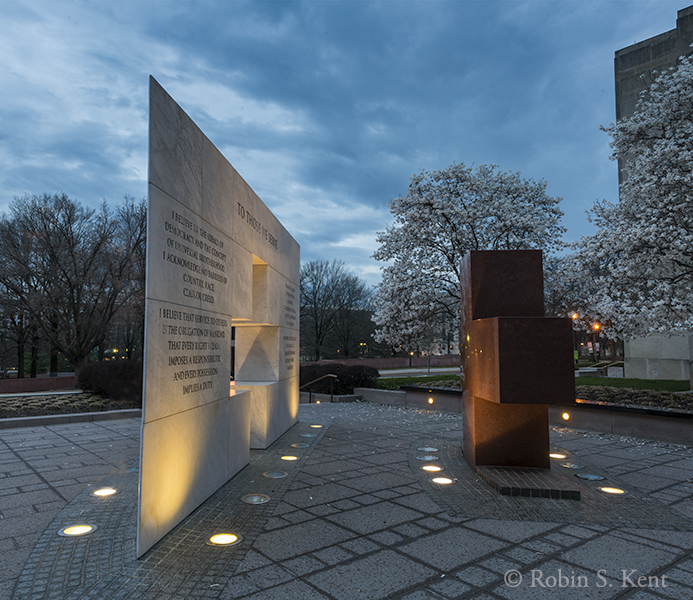 So I obliged them, trying out a few new compositions of the Memorial with some of the trees as a backdrop. The image below is a sample. 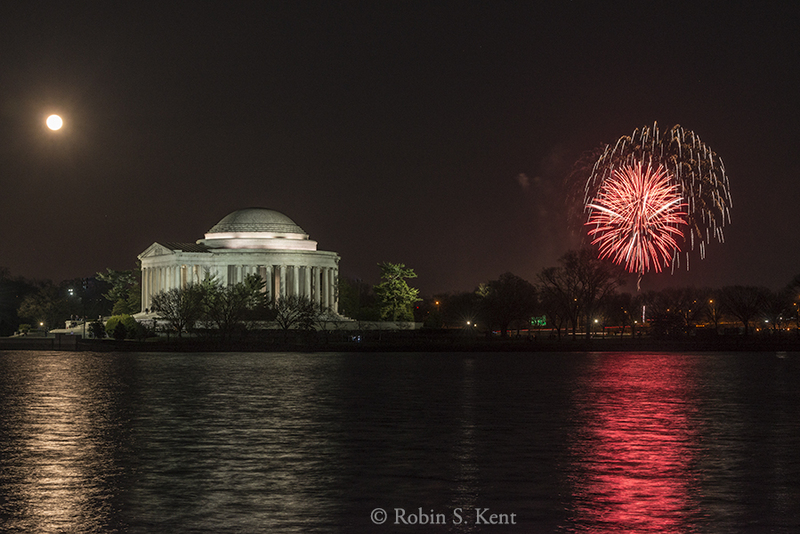 The conditions in the Tidal Basin itself were less positive. The heavy cloud cover prevented any color from the rising sun and a medium breeze eliminated any chances for an interesting reflection in the water. But as the image below shows, the trees are doing their part. 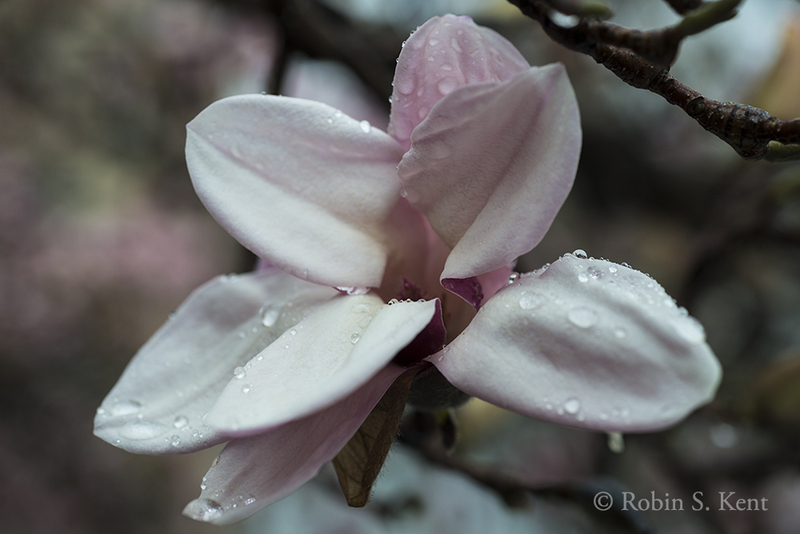 Finally, to provide a better idea of the status of the blossoms this morning, the image below shows a close-up. 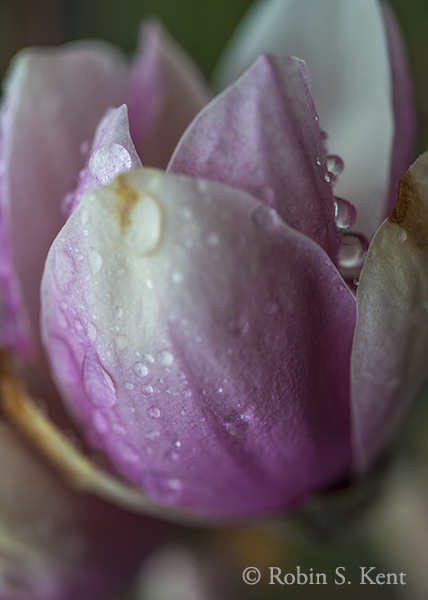 If today’s forecast of temperatures in the low 50s holds true, the blossoms’ emergence will be a little less rapid. My advice: get down there as soon as you think the weather is favorable for your visit. The crowds will be there soon. 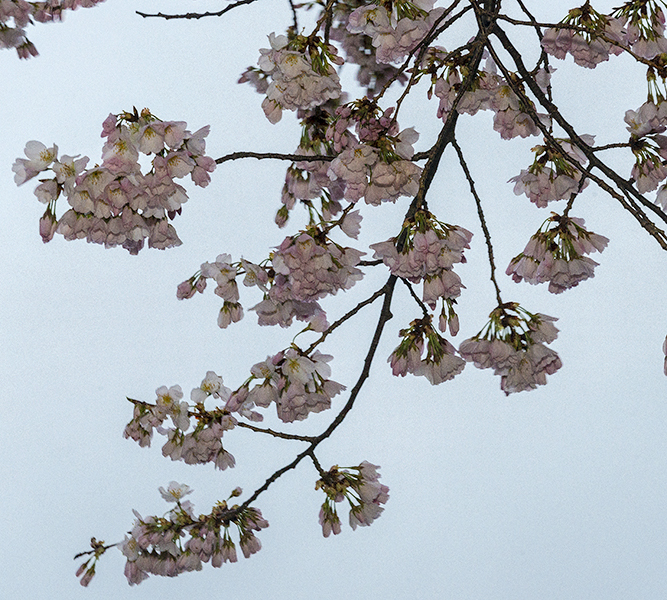 Although the cherry blossoms have yet to fully awaken, there are plenty of other photographic opportunities right now in Washington, DC. 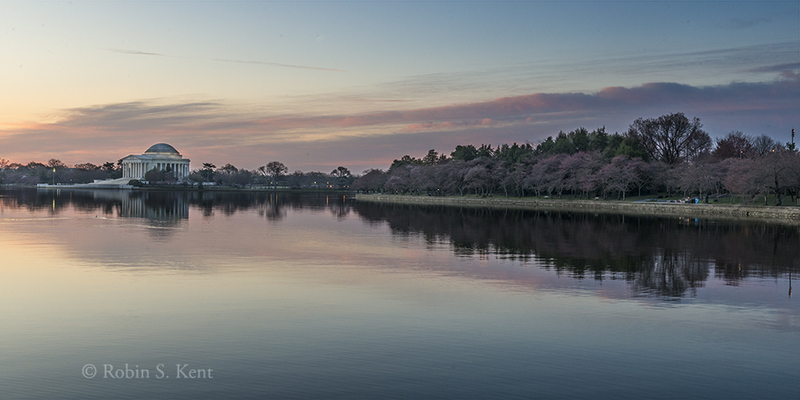 At sunrise two days ago, the tidal basin was almost completely deserted. The sky was clear which means you can get the shot below as the sun clears the horizon. At sunrise the next day, rain clouds were coming in from the west but there were some openings in the eastern sky. 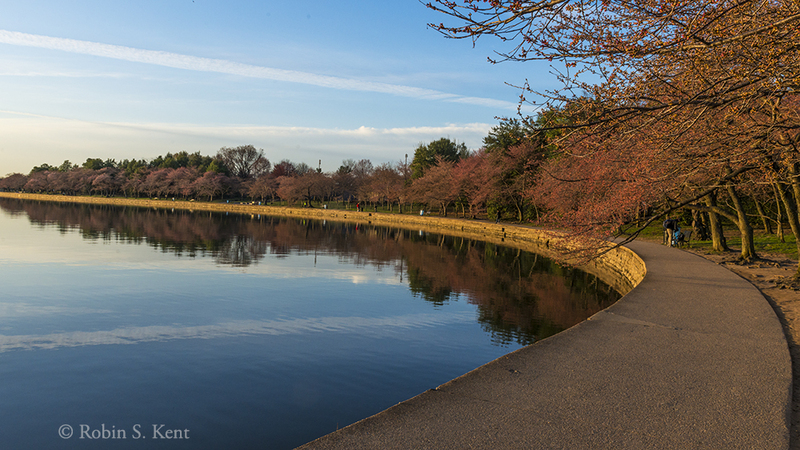 Again, the tidal basin was deserted. 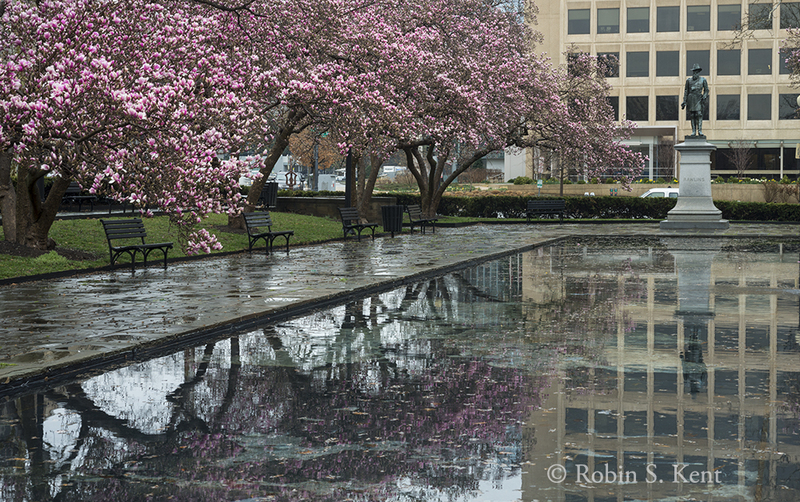 The rain started within an hour after the image above was taken but it was a light rain so I checked out the status of the pink magnolia trees in Rawlins Park (E Street, Foggy Bottom) that usually are open before the cherry blossoms. While photographing the square, I noticed some white magnolias across the street at the Red Cross National Headquarters (20th and E Streets NW). A quick check showed that an evening shot might be worthwhile. 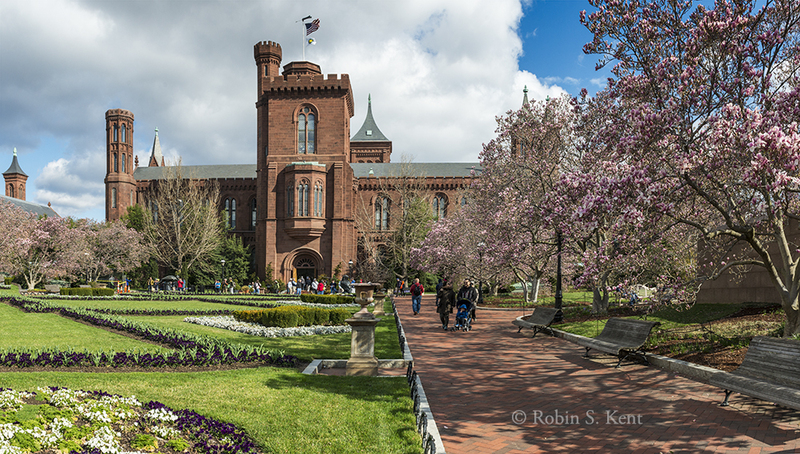 This morning, I checked out the Enid Haupt Garden at the Smithsonian Castle on Independence Avenue. If you want to photograph these trees, don’t delay. They go quickly and inclement weather is forecast for mid-week.You can also find them in the Sculpture Garden (National Gallery of Art) and at the George Mason Memorial near the Jefferson Memorial. The signs are unmistakable: the calendar says March, sunrise is coming earlier each day, the temperatures are rising, and the snow is disappearing. After all, it’s been 3 years since I got a decent image on March 12th. So yesterday afternoon (March 12th), I made a scouting run into the city to check out a few sites for possible photo opportunities. 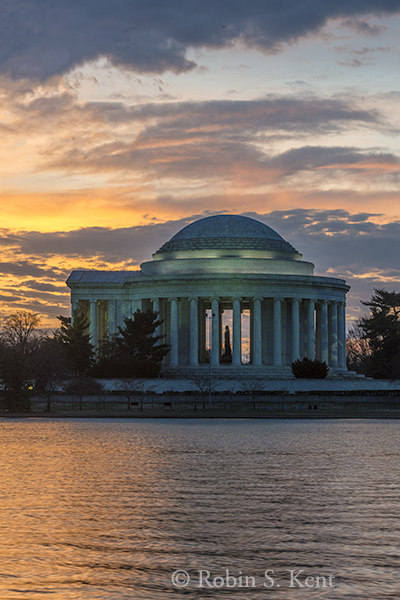 As I made the rounds, it appeared that conditions were promising for a sunset image (see below) so I kept my eye on the clouds building up as I explored the area around the National Mall. The scouting findings may be of interest to photographers in the Washington, DC area, others can skip to the end and see what happened at 7:25 PM. Solar Cycle: For the next few days, the late afternoon sun (when skies are clear) will be providing some opportunities as it illuminates the Federal Triangle Buildings along the north side of Constitution Avenue and the recently renovated Arts and Industries Building on Independence Avenue. Fountains: As usual at this time of year, virtually all of the fountains are still shut down for the winter. 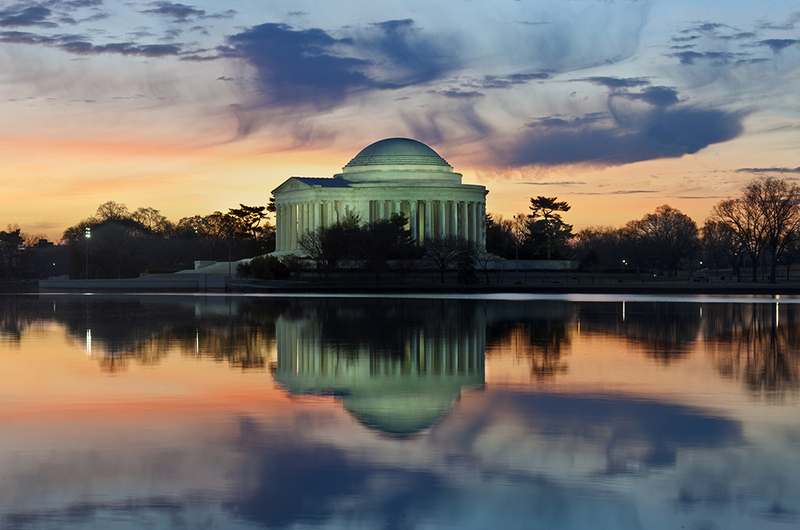 This includes the fountains and pool at the World War II Memorial and the Reflecting Pool between the WW II Memorial and the Lincoln Memorial. In addition, the waterfall at the northwest corner of the Museum of the American Indian is dry and the waterfalls at the FDR Memorial are also turned off. 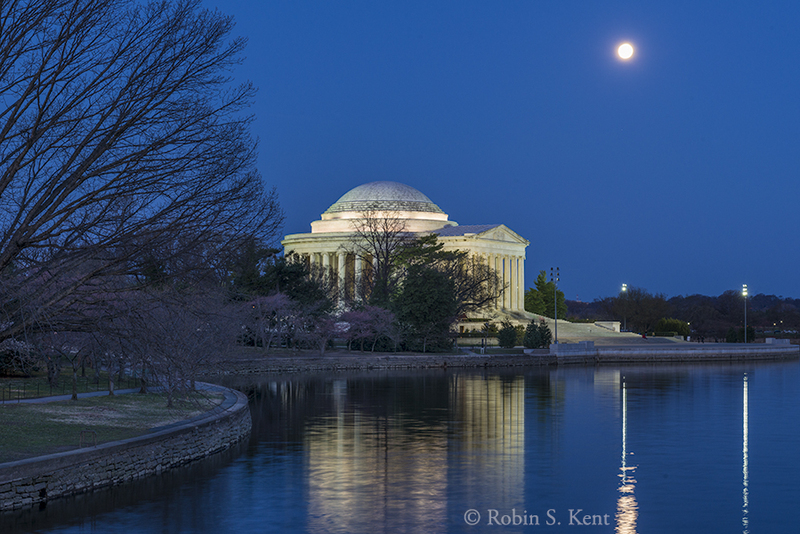 The Tidal Basin: There is a significant amount of ice still in the Basin, but this should be melted in a few days. National Gallery, East Wing: The large construction crane is finally gone, although there is still a considerable amount of fencing and construction equipment on the south and east sides of the building. However, there are good angles on the west side of the building. 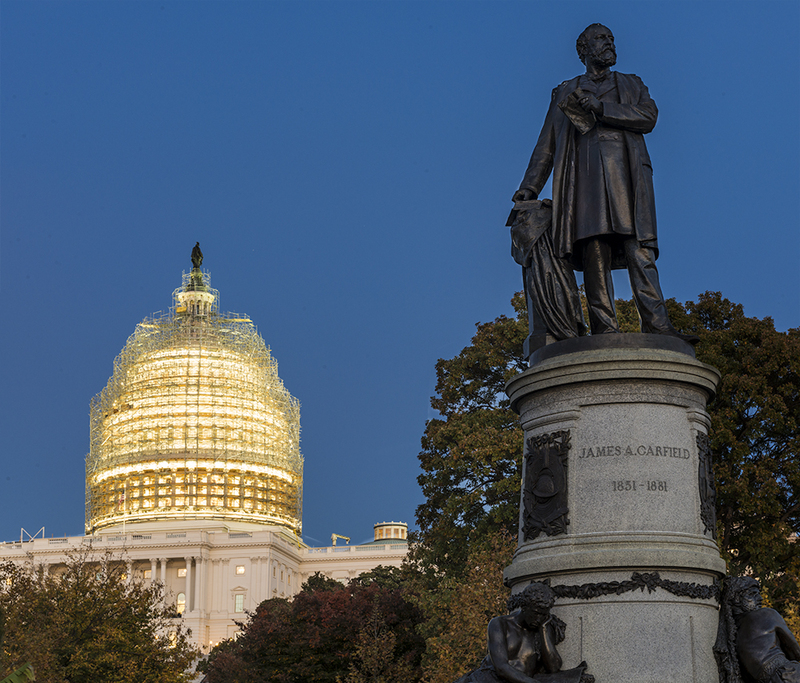 Ongoing Construction: The US Capitol is still under scaffolding, of course, and the white plastic wrap covering part of the scaffolding has been altered for the worse (who would have thought that was possible) by adding a section with a tawdry taupe color. The new African American Museum is still far from completion and news reports state that the opening date has been pushed back to early 2017. There is better news a few blocks to the west where the interminable construction project for a relatively small flood control wall (17th Street and Constitution Avenue) is all but wrapped up. The unsightly wooden fence on the northeast corner of 17th and Constitution is gone, leaving a rather graceful stone wall curving toward the Washington Monument. Across 17th, the construction equipment has been removed and the landscaping seems completed. However, there are still some chain link fences protecting the larger trees along 17th Street. March 14: DC Rock ‘n Roll Marathon: The Start Time 7:30 AM likely will complicate efforts to photograph anything else so plan accordingly. Details here. 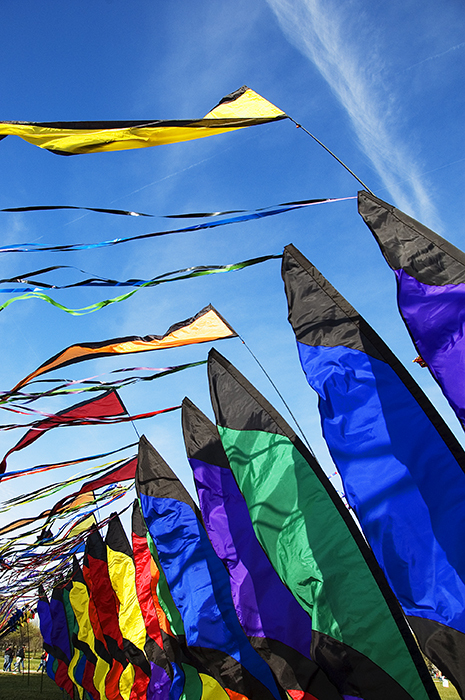 March 20: The Equinox. Check your Photographer’s Ephemeris app for an opportunity near you. 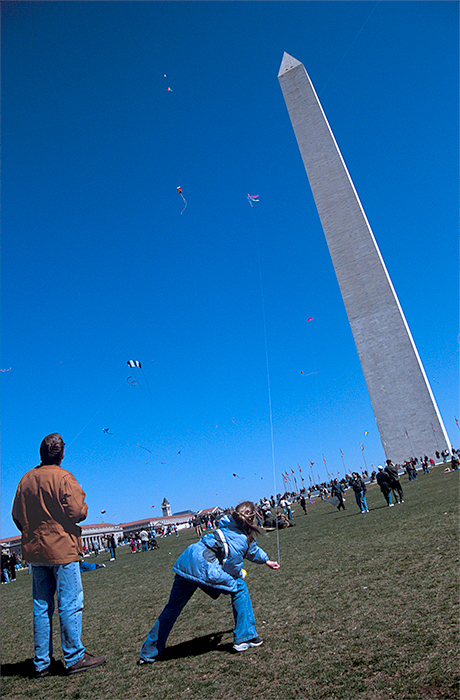 March 28: Kite Festival, the long-running kite festival will be in its usual location on the grounds of the Washington Monument starting at 10:00 AM. For details, click here. April 4: Full Moon. Check your Photographer’s Ephemeris app for an opportunity near you. 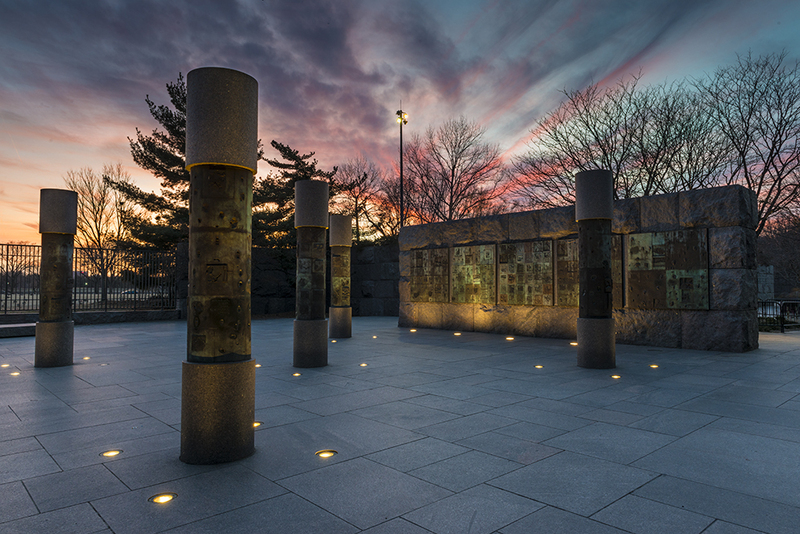 As the sun edged closer to the horizon last night, I made my way over to the Franklin D. Roosevelt Memorial which is located on the west side of the Tidal Basin. DC locals might think this is a strange location to capture a sunset, but I thought it would be a good backdrop for a specific feature at the Memorial. The result is shown below. 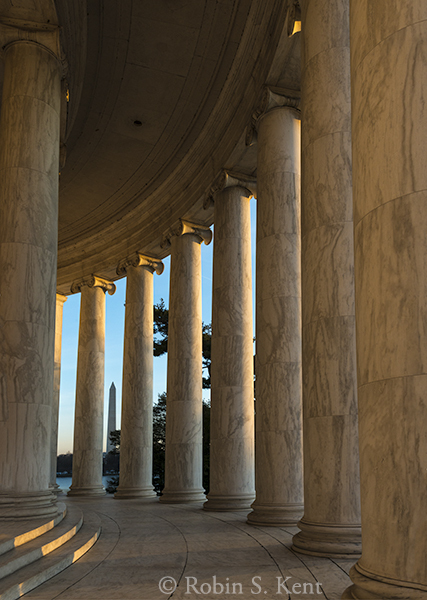 The Memorial, on 7.5 acres chronicles the four terms of Roosevelt’s Presidency. This section, with the five pillars and five panels on the wall, were intended to represent the social programs (New Deal) during his presidency. The design has been criticized as the “least successful” of the many sculptures in the Memorial, and I would agree that their intended symbolism is opaque. Nevertheless, I have found them to be an interesting photographic subject. 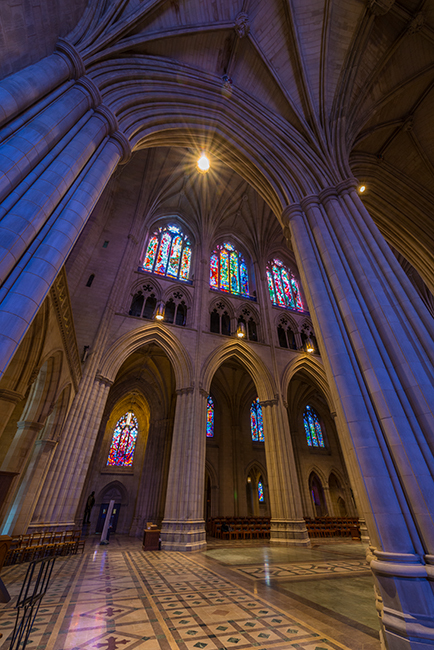 The Washington National Cathedral is one of the great interior spaces in the city. 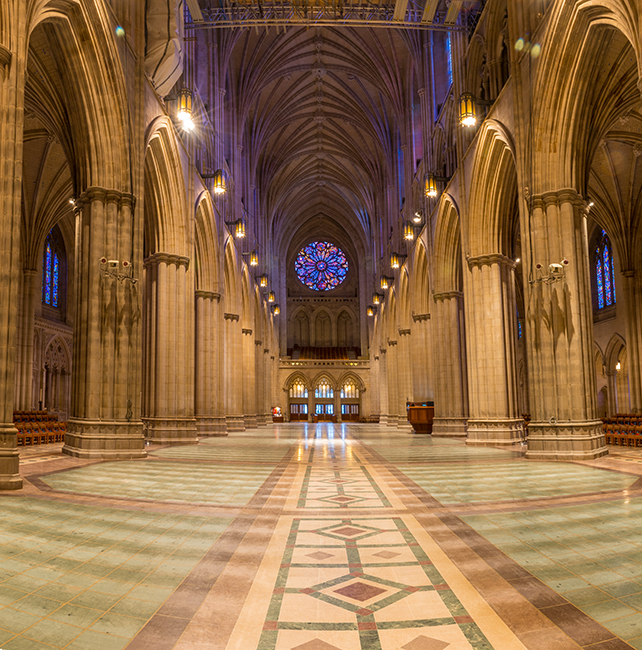 This week, it will be especially interesting because all of the seating has been removed from the nave. In a special week-long program, the Cathedral is evoking the experience of Gothic cathedrals centuries ago when there was no seating. The program (“Seeing Deeper”) included two morning photo sessions, allowing photographers to sign up for an opportunity to take pictures before normal opening hours. Thanks to the sharp eye of my sister, I was alerted in time to snag one of the limited number of tickets for this morning’s session. 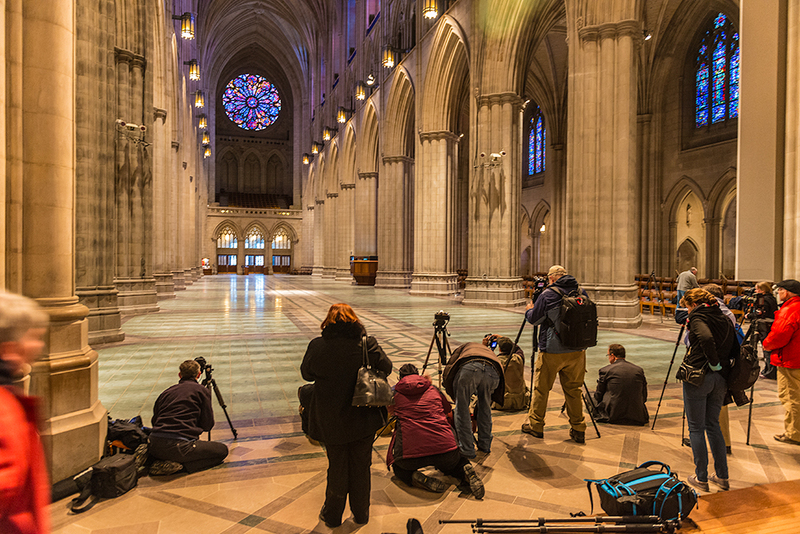 The event was well-organized as the Cathedral staff understood what was desired by everyone in the group: An unobstructed long view of the nave with no other photographers milling about in the scene. We were guided to the east end of the nave where there was sufficient space to set up without obstructing the efforts of others. After about 20 minutes, we were released to wander about the main level and photograph whatever struck our fancy. The other good news is that much of the construction paraphanalia associated with the repair of earthquake damage is gone, such as the netting that had been hanging from the ceiling to protect against falling debris. Some of the scaffolding is still there (see first image above), but the photography opportunities are much improved. Information on the other events associated with the Seeing Deeper program can be found at the Cathedral’s web site.